The Parents Plus Adolescent programme and Working Things Out programme have been developed in partnership with Irish parents and adolescents. In 2011-2012 teachers in 14 NBSS partner schools were trained in the Parents Plus and Working Things Out programmes. The Parents Plus Adolescents programme is a practical and positive evidence-based parenting course designed to support and empower parents to manage and solve behaviour problems, to create satisfying and enjoyable family relationships and assist young people to grow up to reach their full potential. The programme can be delivered as a general parenting programme targeted at parents who are dealing with the normal ups and downs of bringing up teenagers, and also as an intervention targeted at parents whose children are exhibiting specific behavioural, emotional and developmental problems. Working Things Out is a sister programme to the Parents Plus Adolescents programme. The programme contains the personal stories of adolescents who overcame personal problems in their lives such as Bullying, School Pressures, Conflict with Parents as well as mental health issues such as Anxiety, Depression, ADHD, OCD, Self-harm and Suicide. The stories are illustrated by animation and graphics, narrated by young people and backed up by mental health information and handouts for facilitators/teachers. Working Things Out can be used as a preventative programme to educate adolescents about positive mental health. 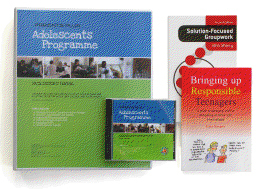 The Parents Plus Adolescent programme and Working Things Out programme have been developed in partnership with Irish parents and adolescents. Both programmes follow Cognitive Behaviour Therapy (CBT) principles. The basic principle of CBT is that in any given situation a person will have thoughts and feelings about the situation and behave in a certain way. These thoughts, feelings and actions all interact and influence each other. CBT helps people to identify cognitive patterns or thoughts and emotions that are linked with behaviours and helps them to learn new behaviours and new ways of coping with events, often involving the learning of particular skills. In 2011-2012 teachers in 14 NBSS partner schools were trained in the Parents Plus and Working Things Out programmes by mental health professionals from the Mater Hospital. After two days of training the teachers returned to their schools to implement the programme with students and their parents over the course of 8 weeks. For the duration of the initiative all teachers could access support and advice from the Mater Parent Plus team and the school’s NBSS Regional Development Officer and Assistant National Coordinator. The Parents Plus and Working Things Out programmes will be introduced to further NBSS partner schools from September 2013. *Parents Plus was founded by Dr. John Sharry (Social Worker/Psychotherapist) and Prof. Carol Fitzpatrick (Consultant Child and Adolescent Psychiatrist) in 1998, with the specific aims of developing educational and therapeutic materials for families and children and providing support and training to professionals working with children and families. Parents Plus was established as a registered charity under the auspices of the Mater Hospital, Dublin in 2001.